Morozov’s stationary plasma thrusters (SPTs) operating with xenon have been successfully used for many years in space technology. At the same time, due to the high cost of xenon, interest has arisen in alternate working substances. In a number of works, specific features and characteristics of SPTs operating with krypton, which is produced in greater amounts and is one order of magnitude cheaper than xenon, were studied. It was shown that SPTs operating with krypton under typical SPT conditions have traditional characteristics; however, their thrust efficiency is significantly lower than that of thrusters operating with xenon. One of the main reasons for the reduction in the thrust efficiency is the lower conversion efficiency of krypton atoms into ions, which depends on many factors. The most important among them is the krypton flow rate, which determines the plasma density in the acceleration channel. The influence of this parameter on the characteristics of SPTs operating with krypton has not yet received sufficient study, and most works were carried out using one model and in a limited range of krypton flow rates. This paper presents results of a comparative study of the influence of the xenon and krypton flow rates on the characteristics of different-scale SPTs in a wide range of gas flow rates. 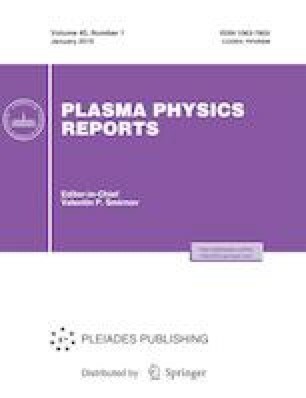 The results of this study provide information on the specific features of SPTs operating with krypton for different values of the gas flow rate and different geometries of the exit part of the acceleration channel. This information can be helpful for the development of advanced thrusters operating with krypton. This work was supported by the Russian Science Foundation, grant no. 16-19-10429.